This marina is situated within the Golfe Dolce Bay in Golfito, Costa Rica. Golfito provides a safe and natural harbor for loading the fruit loading the fruit company’s “Great White Fleet” of banana boats. Golfito was chosen by United Fruit executives for its calm, deep waters which the sun’s hot, tropical rays. Golfito is the only safe protected harbor in Central America and in this place the leading yacht transportation companies ‘pick-up’ and ‘drop-off’ vessels. 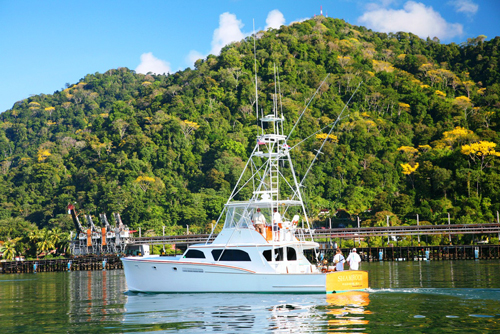 Bahia Escondia will probably be the most advanced Costa Rica marina in Golfito. When the construction will be completed, this Costa Rica Marina will be able to provide 231 marina slips that ranging from 45-260 feet. And this Marina slips will most likely start in the low $300,000 range. A golf cart concierge and a high speed fuel dock will also be included. There is a bayside village, aside from the marina, where you will find private residences, town home, boutique shops, spa, hotel, restaurants, yacht club and also pool for the marina slip owners of Costa Rica. For those slip owners there is a hospital nearby the marina and also airport for all of those Costa Rica marina slip owners needs. An eco-adventure center is being built for the children so that they can marvel at what National Geographic calls one of the most diverse eco-systems in the Americas. In this Marina you will also find casino for spending some enjoyable moment with you friends. In this marina sight you will get the opportunity to explore the beauty of largest rainforest, hiking, golfing, boating, fishing, surfing, diving, walking on the miles of beaches.